Which is the main action in Japanese verb stem of masu form plus nagara sentence? Which is the Main Action in ながら Sentence? I have just learnt the nagara sentence from my Japanese class. While I know the sentence means doing two things at the same time, I don't know whether there is a main action or secondary action. Can you please explain? 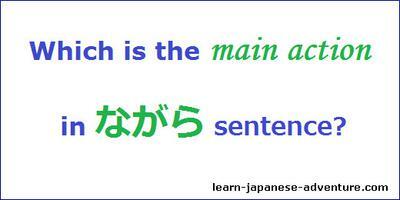 In Japanese, the last verb in a sentence is always the main action. So in short, the answer to your question is that the main action for Japanese verb stem of masu form plus nagara sentence is the second verb in the sentence. In the sentence pattern, Verb2 is the main action while Verb1 is the sub-action. Meaning: While I am having a meal, I am reading a newspaper. In the above case, having a meal is the main action while reading newspaper is the sub-action. Meaning: While I am reading a newspaper, I am having a meal. In this case, reading newspaper is the main action while having a meal is the sub-action. Meaning: I watched TV while doing my homework. Meaning: I sing while walking. Main action: walking, sub-action: singing. Meaning: My elder sister skimmed the book while making the dish. Main action: made the dish, sub-action: skimming the (recipe's) book. In normal case, you will say 本を読む (hon wo yomu). You read from beginning to the end and understand the book. However, for dictionary, encyclopedia, cook book or recipe's book (for this case), etc, you never read but just skim through, look up what you want and never read from beginning to the end. Therefore when you are skimming, browsing or referring, you should use 見る (miru) instead of 読む (yomu). Comments for Which is the main action in Japanese verb stem of masu form plus nagara sentence? In English grammar, the clause with "while" is considered as the main sentence or the main action. Thus, to avoid confusion in the translation, the English clause with "while" must appear in the second sentence of the Japanese sentence. In the same manner that when translating a Japanese to English sentence, the second sentence of a Japanese is the clause to which "while should be attached to. Example) I sing while walking. There is no need to identify anymore which is which, since obviously walking is the main action since it is accompanied by the term "while"
Meaning: I am having a meal while reading newspaper. In English, the clause with "while" is considered as the main action of the sentence.Thus the correct English translation should be: While I am having a meal, I am reading a newspaper. Thanks for the correction of the English grammar. I have corrected all the sentences. According to the rule stated, this means: "Let's talk (main action) while we (incidentally) go to the station". Grammatically fine, perhaps, but a bizarre situation. If it in fact means (as one would expect in real life): "While we go to the station (main action) lets (incidentally) talk" then the sentence is a counter example to the rule stated. I think it's the perspective of how the speaker view that counts. If the speaker thinks that "Let's talk" is the main action that he is doing and that "going to the station" is the sub-action, then the sentence is fine.